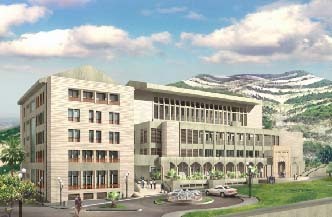 Detailed master planning, design, supervision and project management of a 37,500 sq meters main library and central administration building at the LAU Campus at Byblos. Although modern and prestigious in character, this building was designed in such a way that it blends in its natural and built-up environment. It reflects the distinct architectural heritage of the region while, at the same time, acts as a distinctive landmark to the newly developing university campus. 13,199 sq meters main library. 5,466 sq meters for campus central administration offices and support. 18,790 sq meters of underground car parking space. Independent entrances to the administration and library sections of the building. Prestigious entrance courtyard with landmark. Conceptual and detailed Master planning, preliminary design of roads and circulation network, tendering, supervision and project management of Phase 1 implementation.